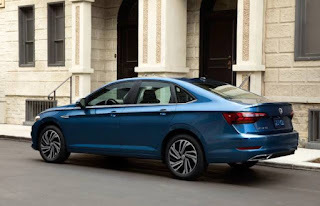 It's been a long time coming - I would say too long - but Volkswagen has finally redesigned its most popular model in the U.S. and Canada, the Jetta sedan. The previous car, introduced in 2011, was seen as a rather bland car, relying on a dated platform and using cheap materials, and was improved over the years, but for the new seventh-generation Jetta, VW has upped the ante a bit by trying to make it more refined while keeping the price low enough to sell it as a true people's car. After all, Volkswagen is one of only three European brands selling cars in the U.S. and Canada at mass-market prices, and the other two - Fiat and Mini - restrict themselves to retro cars with limited appeal. 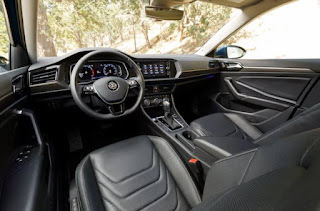 The Jetta's engine is the 1.4-liter turbocharged powerplant from the previous car, producing a respectable 147 horsepower with either a six-speed manual transmission or an optional eight-speed automatic transmission option. 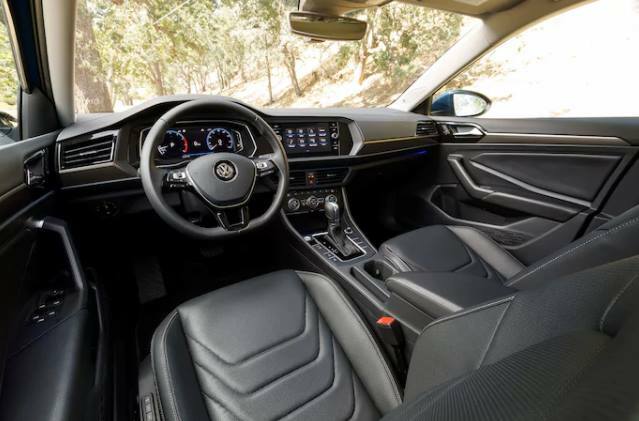 The stick should be good news for drivers who like to put a little extra sport in their rides, and they'll be piloting their new Jetta in a more well-appointed interior. Here are some of the goodies inside, based of course on what trim level you get: optional ten-color wraparound ambient lighting, a high-resolution digital instrument panel, available leather seats with optional heating and ventilation, seat position memory, and a stereo system with smartphone-sourced sound through a 400-watt Beats Audio setup, courtesy of one Mr. Andre Young (Dr. Dre to you, bud!). A compact disc player? Whatsa matter with you, ya from the the dial-up Internet age or something, boy? Yeah, I'd better learn how to download music on a device if I need to get a new car. 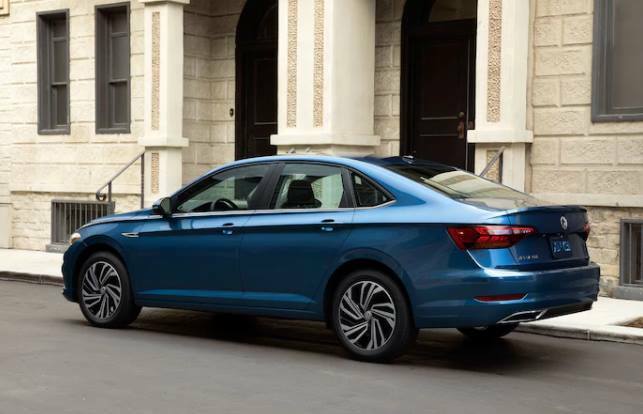 The styling is sharper than on the sixth-generation Jetta it replaces, with an edgier, more geometric profile; it almost looks like the Ford Fusion, in fact, with cues from VW's upcoming Arteon four-door coupe. The headlight and taillight lenses have a very chiseled look, and the bulbs inside are high-quality LED lights. The car is larger as well, with a wheelbase of 105.7 inches, and it sits on Volkswagen's innovative Modular Transverse Matrix (or MQB, its German initials) platform, having shed a platform that dates back over a decade. That's bound to improve the ride, but for every one step forward for Volkswagen, there is a step back; the suspension has been softened a bit in response to customer complaints about the old Jetta, which I'm both saddened and pleased to hear. Saddened because none of the casual VW customers the brand has acquired through its old, watered-down Jetta have grown to appreciate what German character remained, but pleased because at least VW is listening to its customers . . . and since the Jetta is VW's bread-and-butter car in the New World, it's important that Volkswagen make money from the Jetta so it can continue to sell the more Teutonic Golf, which is Volkswagen to those of us dubbers who came of age in the watercooled era, in North America. But in the U.S. and Canada, we still can't get VW to bring back the two-door Golf . . . however, that's another story. This was the year Volkswagen hoped to sell 800,000 VW-brand cars in the United States, but it became apparent long ago, even before the diesel scandal, that it would never reach that benchmark - the firm couldn't even sell 800,000 cars across all of its brands in the States, not even if it had added Škoda and SEAT to the roster. It may yet take a long time for Volkswagen to reach its once-lofty position in the import-brand car market, but I have a feeling the new Jetta is a step in the right direction. The Polo? Uh, yeah . . . no, that ship has long since sailed. The new Jetta goes on sale in the spring of 2018 as a 2019 model.